Here to share with you seven highlights from Lexis Suites Penang Festive Buffet 2018. 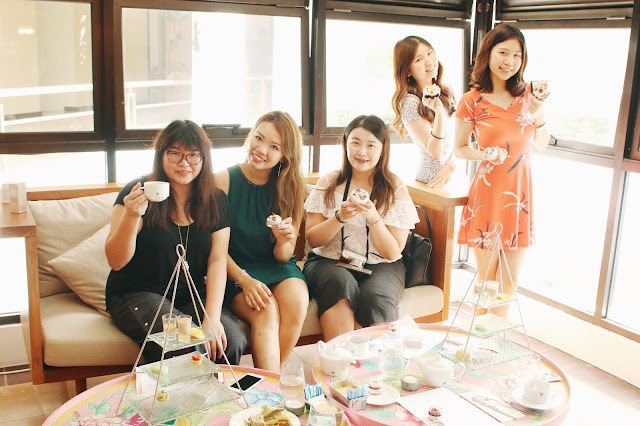 Wrap up the year of 2018 with a different kind of X'mas celebration party! While waiting for the table to filled up by your beloved ones, pick some savoury light bites to spare your stomach. No good to drag your appetite on the tantalising dishes right? Spot the gingerbread as well! So happy to have this (because I love pumpkin a lot!) to warm stomach. It doesn't taste rich but promising enough that you will be satisfied over a serving! I would say this is a healthy dish, combo of greens and meat. #2 X'mas must-have: Roasted Turkey! You won't label Christmas celebration buffet without the star of the evening, TURKEY ROAST! The culinary team under the executive chef, Chef Johnno has worked out wholeheartedly to serve the diners. Four flavours of stuffing including mushroom, turkey and sage, duck and mushroom as well as chesnut and apple. This is unbelievably delicious, really out of my expectation. My personal's pick goes to turkey and sage stuffing among all! Fresh catch from sea and farm, you get both at at time in buffet spread. It has drawn my attention at my first sight already! I have total three in the evening, the kids would love it a lot too. I am out of control for this, I take up for 5 slices! It even smells tantalising as I'm taking photo! I strongly recommend to have it while it's served warm in order to achieve the fragrant taste of pumpkin infused into the shell less prawn. Ready for the fragrant cheese burst in molar! Cold cuts are the staple of western delights, and how would you neglect cheese corner at the same time? Be sure to have it while in a leisure talk with cousins, it's free flow after all! The team work out featuring up to five different types to fix your cheesy craving. New fusion dish to me yet acceptable one! Do you know that mozzarella is low-fat cheese? Enjoy it all you can. #5 Sugar rush for the sake of celebration, go for dessert! Round up the evening with a refreshing chilled dessert, I enjoy over the moderate sweetness. I see my favourite jackfruit is there too! Christmas decoration in Lexis Suites is pleasant and cheering overall, especially the artwork on food presentation. Personally, I fall for the 'Mary Go Round' idea on watermelon! 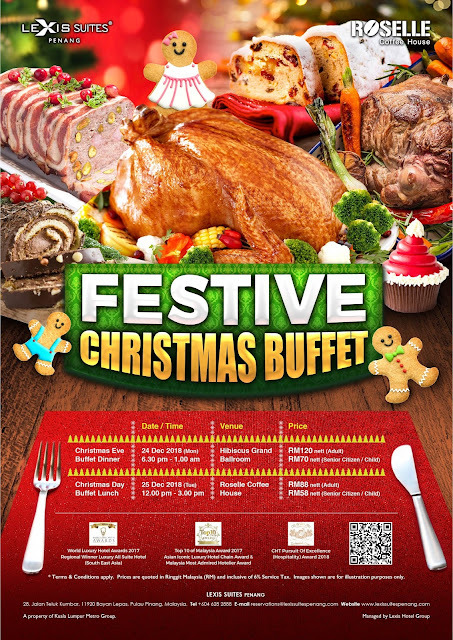 There will also be live band performance during Christmas Eve buffet to hit up the dining hall in the evening. Not to forget, special appearance of Santa Claus and Santarina to distribute candies and gingerbread, games session, and even magic show, the more the merrier! #7 Lucky draw prizes include room stay at Lexis Suites Penang! Another highlight goes to 31 December 2018 (Monday), dine in New Year Eve countdown dinner and party and see if you have lady's luck to bring you the chance of free room stay. 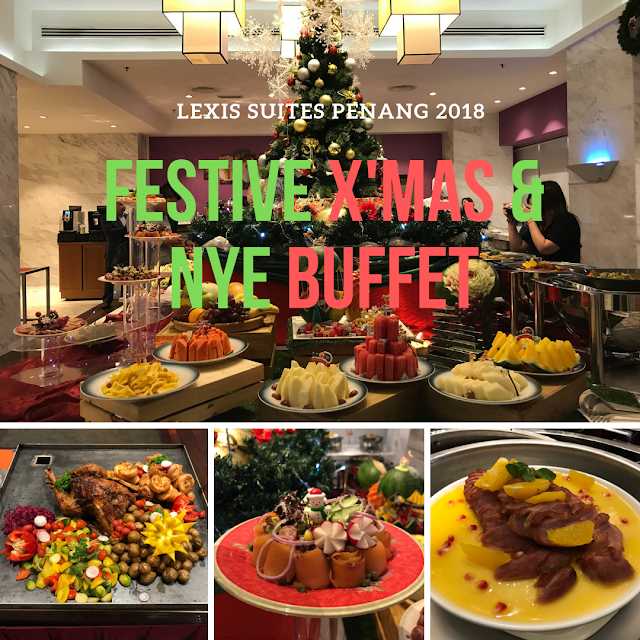 There will be lucky draw session held in Hibiscus Grand Ballroom (dining hall) where every diner stand the equal chance to win amazing prizes including a room stay at Lexis Suites Penang. Gather into a table to fill up merry evening with great food and great companion! 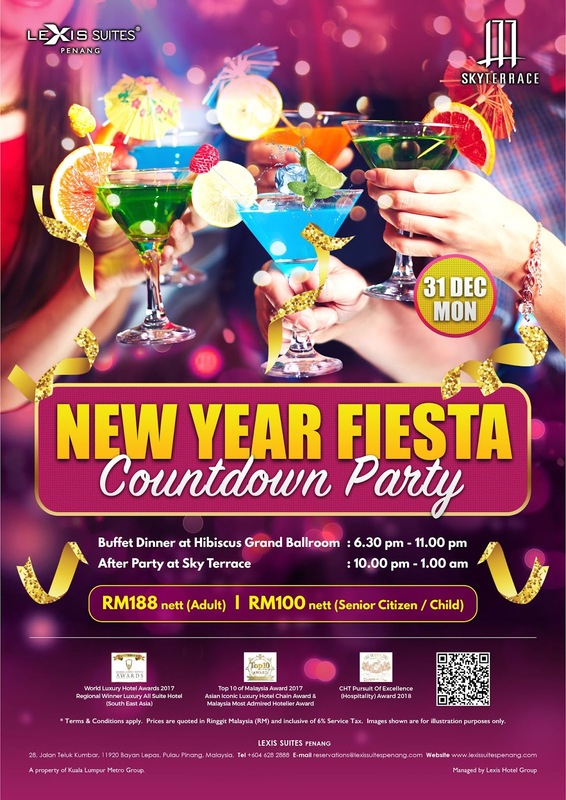 New Year Eve celebration is slightly different than Christmas buffet as the event will be tentatively continued on countdown party at Sky Terrace, rooftop dining bar (24th floor). Let's usher the brand new year together at 24th floor in view of Straits Malacca.